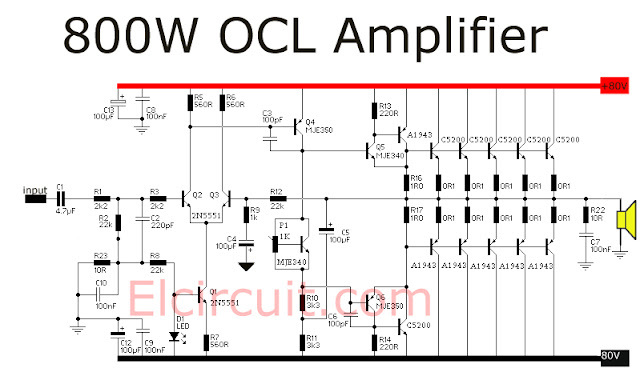 Different from 800W high power amplifier using MOSFET this Circuit 800 Watt power amplifier OCL works with class AB, which generated power efficiency can reach 85 percent. The power amplifier circuit including amplifiers that have high output power, so that the amplifier circuit is very suitable for outdoor use and must use a loudspeaker that corresponds to power this circuit. While the necessary working voltage is symmetrical voltage ± 70 Volt. High output power can be generated for some of the accumulated power from the final amplifier transistor arranged in parallel. It will certainly make a distinct advantage compared to only use a single transistor amplifier end only. 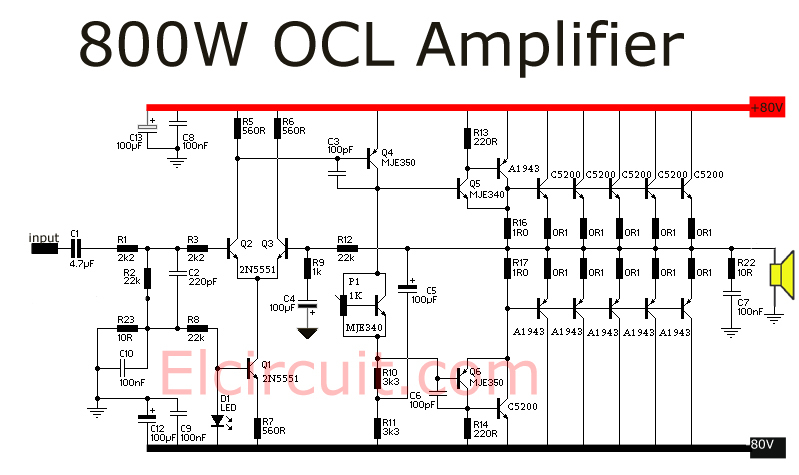 Basically circuit 800 Watt power amplifier OCL is equivalent to OCL circuit in general, which uses differential circuit as the first front amplifier (Pre-Amp), and then confirmed by the driver and final amplifier section. What distinguishes only type of transistor used and some adjustments to the working voltage of each amplifier section. As shown above circuit schematic drawings, prepared by the differential amplifier section transistor Q1, Q2, and Q3. This differential amplifier which will serve as a front amplifier (Pre-Amp) before entering the driver.At the final amplifier arranged in Darlington to get many a bigger gains.After that to produce strengthening higher again, the final amplifier transistor is added with some more transistors are arranged in parallel. P1 trimpot potentiometer resistor that serves to regulate the working bias driver circuit. Later potentiometer P1 in the set to get the best sound (not disabled). Adjustment from potentiometer P1 will affect the sound quality from this amplifier circuit. Usually if the working voltage supplied to the transistor is too large, the sound will be more linear, but there will be hum, this will also make the final amplifier transistor becomes very hot and certainly if left long will damage the final amplifier transistor. Meanwhile, if the work mid (bias) the driver transistor is too small, usually resulting sound will be disabled. A final amplifier arranged with several transistors in parallel there is a shortage, usually heat generated will be uneven, which heat will go to one or two points only transistor so that the heat from each transistor amplifier uneven end. Despite that, all the mandatory final amplifier transistor wearing enough cooling fins. Do not forget to also add the mica insulator transistor amplifier at each end of power amplifier circuit of this 800 Watt OCL. How much the power of the resistor? Can someone translate chinka and indian to English. This sh&t is wearing me down. For $10 per page I will translate to USA English. Uneven heating of the Output transistors.,.,.,why? R16 &17 are 1 ohm? If yes I use 1 ohm. I used 1 pair of the output & got about 120 watts @ 4 ohms. I use 2pair & got the same wattage.The Transformer & power supply isnt the problem. The output voltage is 55 plus & minus.